Quacker clamps (AKA platypus clamps or duckbill clamps) are a staple in the filmmaking industry and are used to hold things like reflectors, bead board, or foamcore. The clamps hold whatever you put in them, and then it connects directly to a grip head. Pretty simple. You might be asking yourself “Adam, why would I want or need one of these weird looking things? I already have a spring clamp and a 5-in-1 reflector.” Well, quacker clamps give you an entire extra axis to adjust the reflector or whatever you’ve got clamped in it. So if you’ve got a lightstand, a clamp, and a reflector you’re stuck with it being straight up and down. You can move left right, forwards, backwards, up down, rotate it, etc. BUT you can’t adjust the tilt of it - which is where the quacker clamp comes in. Having one of these in your kit will give you 360 degrees of adjustability with your reflectors. Now a 5-in-1, a clamp, a lightstand, and some extra time can do almost the same, but quacker clamps can save you that precious time by allowing for easier and more efficient adjustments when you’re on set - and as a freelancer time = $$$. These retail for upwards of $75-80, but we’ll be making these for less than $25 per clamp. So with all that being said let’s get to it. The first thing you want to do is take your clamp, and clamp it onto a scrap piece of wood that’s about ½” wide - we want the jaws to be as parallel as we can get them which you’ll see in a moment. Mark each corner here with a marker just for a little reference - we don’t need to mark both sides of the clamp because we’re going to be drilling THROUGH all of this - which is one of the reasons we want our jaws to be parallel. Then using a drill bit - I used a ¼” one - drill through the clamp, the wood, and we want to drill through the other side of the clamp as well - again, why we need our jaws to be parallel. Then repeat for the other side. Once you’ve drilled your two holes, unclamp the piece of wood, and just set everything aside for right now. Then, get your sheet metal out. We now want to cut two 6” squares. Measure 6” on one side, mark the other side , and then draw your line. Go ahead and cut that piece, a hacksaw will work just fine, and then mark and cut a second piece out as well so you have two 6” squares. Before we do anything else you’ll want to smooth out these edges and round out the corners because they’re still a little sharp - I used a dremel and a metal grinding bit to get rid of all the sharp corners and edges, and then touched everything up with a metal file. Be sure to check the corners and edges as you’re filing them down to make sure you’ve gotten everything smooth enough - you don’t want anyone cutting themselves while you’re out on set. Once your squares are smooth, grab your piece of wood, put the two pieces of sheet metal around it, and because we’re adding in a little more width, you’ll probably need to expand the clamps a small amount, then clamp the metal down with the wood inside - It’s really important that everything is nice and square so feel free to readjust everything and clamp it back down. Then using the holes we already drilled in the clamp, we want to drill holes through the sheet metal, but this time make sure you only drill through each side - we DO NOT want to drill all the way through this time. Once all the holes are drilled we want to bend the sheet metal in, so we’re bending each piece the right way make a little mark on each side so you know which side goes where and what the outside edge is. Then unclamp everything and set the clamp aside for now - take one of your pieces of sheet metal, mark a line 2 inches up from the bottom, which is where we’ll bend the metal. Do this for each piece. Then, using another scrap piece of wood, line up the straight edge with the line we just drew, and clamp it all together - we’ll use this as a bit of a guideline or template to help us with the bend. Clamp that piece into a vice or down onto your workbench, I used another scrap piece of wood to help keep things square and tight inside my vice, and then simply apply a bit of pressure to bend it. You just want a little bit of a bend - so go slow, and be careful. And repeat for the other piece. Now that everything is done we want to put it all together. I bought 4 nylock or nylon lock nuts and 4 small ½” bolts to hold this together. 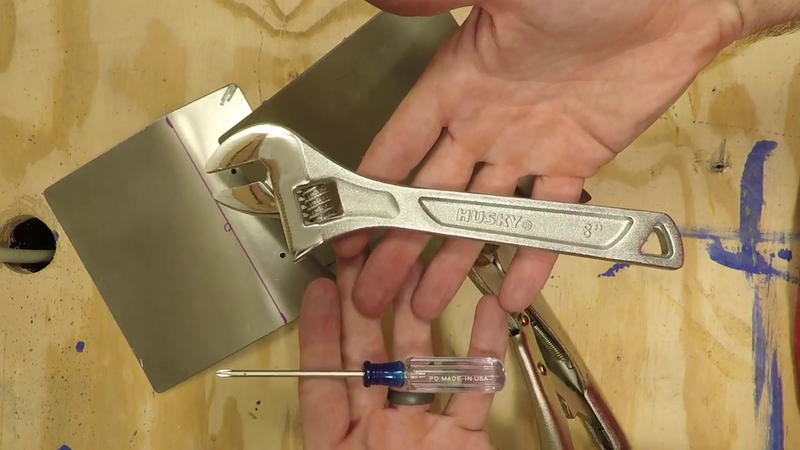 Grab your clamp, and one of the squares of sheet metal, and put one of the bolts through a hole on the outside and then screw on the nylock nut on the inside. Do the same for the other hole, then use a screwdriver and a wrench to tighten everything down. Repeat these steps with the other side. Then use your wrench and make sure everything is nice and tight. To get rid of the marks we made on the sheet metal, just use a small bit of mineral spirits, paint thinner, or nail polish remover and wipe them clean. 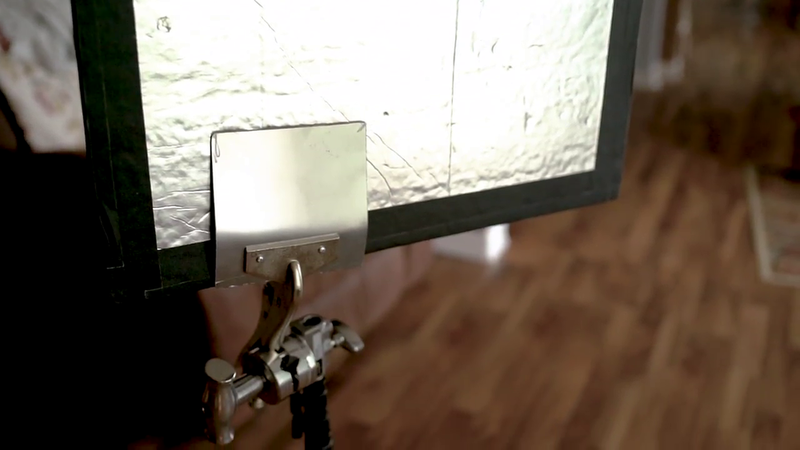 To use your clamp, grab your favorite reflector or foam board, clamp it down, and then attach it to a griphead. These clamps will work like this, but for full functionality you might want to consider having a ⅝” adapter welded to the side. You can also use the adjustment end as a proto-⅝” adapter and put it into your grip hear that way. Quacker clamps are a great addition to your kit, and even if you don’t use it on every shoot, having one or two can really save you some time and ultimately add value to your productions. If you’ve got any questions, comments, or fun nicknames for these clamps let us know! And if there are other tutorials you’d like to see share those with us too.